There is really now way around FOTOBODEN™ at the coming EuroShop – the Worlds No. 1 Retail Trade Fair. 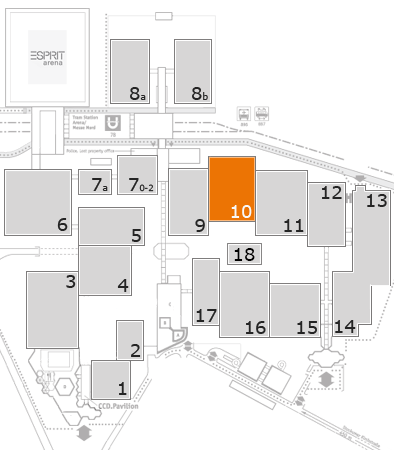 Not only because the Kaarst-based company will be one of the biggest exhibitors at the trade fair with some 1,500m² of “covered” floor space in the truest sense of the word. Or because the giant logo of the trade fair at Entrance Nord, that all visitors use to enter or leave the premises, is made of this custom-printable vinyl flooring. FOTOBODEN™ is simply the all-round talent for marketing applications in retail, at trade fairs or events. “This is also why we have several stands at EuroShop,” laughs Timo Michalik, member of the board at visuals united ag and inventor of FOTOBODEN™. “Our flooring fits so many different segments – that we also fit various exhibition and product categories at the trade fair.” Therefore the FOTOBODEN™ team in Hall 3, Stand 3D82 displays just as diverse products as their colleagues do at the main stand in Hall 10, Stand 10G78. Here visitors will also find live project presentations demonstrating the effect produced by selected floorings at the POS with the help of various examples. “FOTOBODEN™ is a booster when it comes to staging products and generating high retail sales as a result of increased visitor/shopper interest,” adds Timo Michalik with conviction. Pioneer Trading Company GmbH (Hall 10, Stand 10D21I) presents the fastest shop window in the world: here a living display mannequin demonstrates in a true-to-life store window how to turn a wonderful winter world into a summery sunshine paradise in as few as 30 seconds – of course also with the help of FOTOBODEN™! FOTOBODEN™ creates a futuristic Mars landscape with stones, dust and craters. On five days there will be lectures on flooring trends in retail: on 5/7/8/9 March at 2.00 pm Timo Michalik will deliver a talk entitled “Bodenwerbung wirkt!” (Floor Advertising Works). Extraordinary, modern, timeless: ESG Einkaufs- und Servicegesellschaft mbH (ESG) in Hall 4, Stand 4E24 selected a trade fair stand with a hip concrete look, needless to say, FOTOBODEN™ was a must-have to make the impression complete. Fancy a break from the hustle and bustle at the trade fair? Then head for the stand with that coffee-house look complete with FOTOBODEN™ and visit the trade magazine m+a report in Hall 4, Stand 4E39. Small yet refined: a 15 m² stand featuring a creative floor-wall combination from our own FOTOBODEN™ design catalogues was designed for beta-web GmbH (Hall 7, Stand 7E19). FOTOBODEN™ is synonymous with large-format and photo-realistic prints boasting 1.8 b pixel per square metre on vinyl. With webs up to 3.15m wide one-piece floor coverings of up to 20 metres length can be realised as well as areas of 1,000 m² and more. The special feature: FOTOBODEN™ can be used both indoors and outdoors in almost any location and does not even show any signs of wear when exposed to strong loads by high footfall. Possible applications are virtually unlimited. Be it for interior design, product staging, areas large and small or as a stand-alone design element: FOTOBODEN™ always directs observers attention to the desired area. FOTOBODEN™ is a product from visuals united ag headquartered in Kaarst. The vinyl flooring is protected by a European patent and custom printable. As an advertising and decoration element it makes for higher footfall at the place of use thereby boosting retail sales. It can be used in visual merchandising at the POS and for trade fairs. Museums, TV productions as well as store design and stage building firms also use the material boasting multiple ISO and DIN (German International Norm) certifications. FOTOBODEN™ is 100% recyclable. As a leading specialist in printed flooring visuals united ag offers both printing and product development.